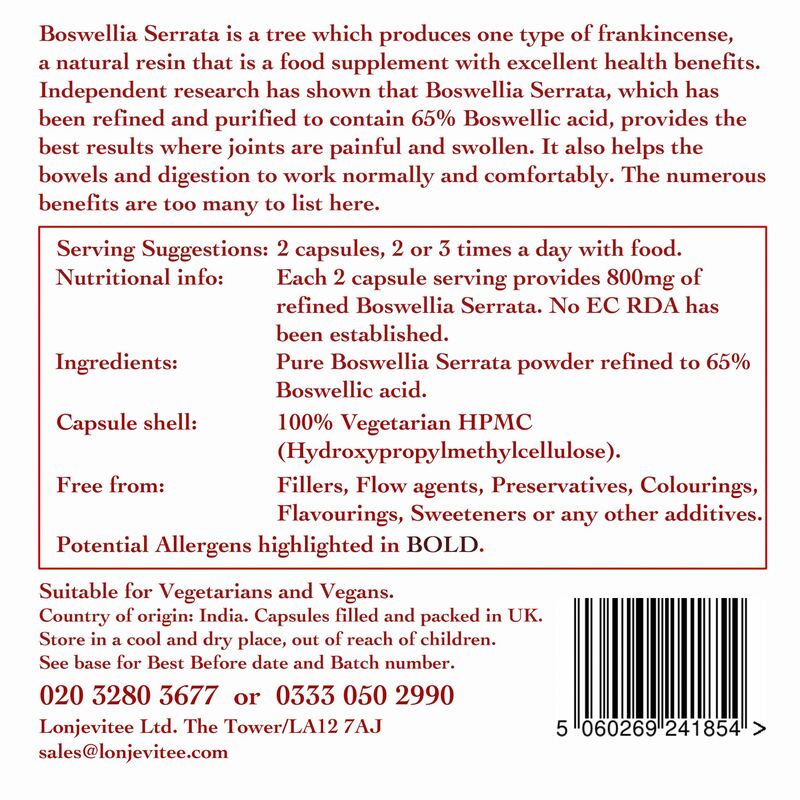 Frankincense (Boswellia Serrata) vegetarian capsules, 100 x 400mg for £6.15, in a stand up pouch. Frankincense (Boswellia Serrata) vegetarian capsules. Contents refined to 65% Boswellic acid with no fillers , flow agents or other additives. Suggested daily intake: 2 capsules 2 or 3 times daily with food. Ingredients: Frankincense (Boswellia Serrata), purified and refined to 65% Boswellic acid. Capsule shell: HPMC (Hydroxypropylmethylcellulose) (pure plant cellulose). PREGNANT WOMEN SHOULD CONSULT A DOCTOR BEFORE TAKING THIS SUPPLEMENT. Boswellia Serrata vegetarian capsules, 100 x 400mg. We chose the best type of refined Boswellia extract to be sure you get the results you want from taking this food supplement. There are no impurities from the Tree or from the collection of the resin. We don't use anything to bulk up the content and we don't add any preservatives or additives. With our capsules you get what you pay for. There are many known health benefits from adding this to your daily food. It is always best to help our body to be healthy rather than to try to treat disease. Some people in Asia and Africa eat this resin as a chewing gum and they therefore get the benefit that way. It has also been used for millenia in traditional medicines. I purchased these as part of a painkilling strategy for cervical arthritis, along with Glucosamine, MSM, and HLA. 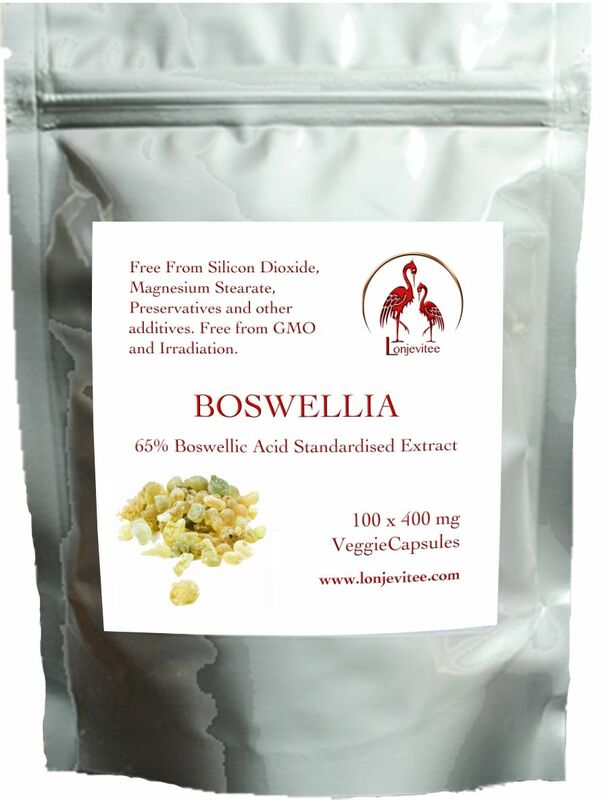 The Boswellia is a great addition to the mix and seems to keep me achefree longer. It is important that the supplement is vegetarian sourced (I'm vegan) so Longevitee's offer was welcome. Just want to let you know that the Boswellia capsules have reduced the pain in my knees considerably. I can walk again with confidence. Just walking down the stairs is still uncomfortable but with the help of new orthotics I hope to settle the cause of my problem. And the Boswellia has indeed helped the digestion. Wonderful herb. I heard about Boswellia, and I gave it to my dog but I didn't try it myself until recently. I'm amazed at the way my chronic back pain has virtually gone, how my finger joints no longer make my days and nights miserable and how my gut problems appear to have vanished practically overnight. This stuff is better than I ever hoped it would be. I take two capsules twice a day with food, together with curcumin capsules, also two twice a day with food. Having suffered with back, leg and shoulder pains for sometime and not obtaining any relief from over the counter remedies I was advised to try Boswellia. I am delighted to say that within less than two months there has been a tremendous improvement which enables me to do things which would have been impossible previously. I certainly would recommend Boswellia to anyone suffering any kind of muscular or joint pain.